These downloads require Adobe Acrobat Reader. Are you employed by New York State Department of Correctional Services? Either as security or civilian staff? Then YOU are eligible to join. It is easy to do! Just download your membership application. 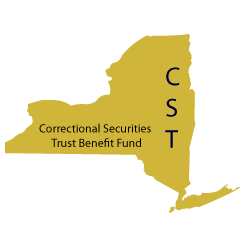 What are the benefits you get when you become a CST member? As a working member you would be eligible for a monthly benefit if you are on Leave Without Pay and are Unable to Return to Work. The Monthly Benefit is based on whatever Health Plan you are enrolled in,this benefit would continue until you return to work or are terminated from employment. There also is a $3,000 Death Benefit which is increased to $6,000 if Death is caused by an Accident. If you remain a member after retirement the Death Benefit is increased to $5,000 regardless of the cause of death.